Having grief support is an important part of the grief journey and healing process. Grief support can come in many different forms including grief support groups through your church, hospice, hospitals, grief centers, bereavement organizations that support a specific group of mourners and even now through Meet-Up groups. 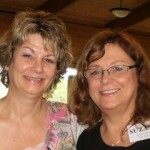 This weekend I was invited to attend a retreat called “Sacred Journey – A Retreat for the Widowed” sponsored by The Grief Project and founder Suzann Eisenberg Murray. The retreat began with grief counselors talking about grief as an experience of change and loss and how grief affects us spiritually mentally, physically emotionally and socially. The attendees were encouraged to remember that death ends a life not a relationship! We continue the relationship with those who have died by talking & praying to them, honoring their memory through new and old traditions, keeping photos in sight to remind us of our relationships. They talked further about the idea that there is no going back to the person we were, rather we’re in between where we were and who we are going to be. This applies to all loss, now just widowed people. There was a session on Journaling Your Way Through Grief. Here we were encouraged to let go of our inner critic, connect with our creative side and simply write. A simple tip to get connected with your inner self is to write down a question with your dominant hand and then write your answer in the non-dominant hand. Generally then our answer will come from our intuition, that inner self that knows the all our answers. Journaling through grief is a process and having trust that it will take you where you want to go in discovery and healing. We were introduced to Labyrinths, which are ancient patterns, thousands of years old and found all over the world. 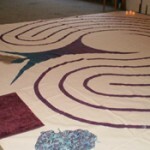 Labyrinth walking can provide a sense of calm that is conducive to meditation, self-exploration and prayer. For me walking the Labyrinth symbolized taking steps to move forward in my life. For everyone else, their walking meant something equally as personal. You can find Labyrinths all over the world, check with your local church’s for more information or to learn more from our mentor Lisa Moriarty and Paths of Peace. 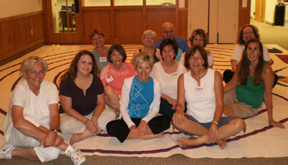 Grief retreats can offer the mourner a safe space to share their story, get support and find a place of hope among other who are on a similar journey. I was humbled to be a companion to others on their grief journey, to witness their courage and strength in sharing their stories and the hope everyone shared when the weekend was over. Yes, there was no going back, everyone was on a new path and through the tears, pain and heartbreak of loss it seemed just a little brighter when we left. Remember you need other people to help you through your grief. Grief retreats & other peer support groups are valuable despite the fact everyone grieves in different times and in different ways. The support of others experiencing loss is powerful. You are not alone. Check out the resources page for a partial list of organizations that offer grief support.